So apparently there’s a trend called ‘pop up retail’ or ‘pop up stores’. It’s not a new trend (I admit, it’s not unusual for me to be a bit out of touch when it comes to popular culture). Anyway, the concept entails a space becoming available for a short amount of time (an hour, a day, etc.) to retail activity that wouldn’t generally occur there. The space may or may not be originally intended for retail activity and the merchandise being sold likely also has a permanent home elsewhere. For some reason, these pop up stores seem to excite people. I guess they create an air of exclusivity both because the location of these stores are not necessarily known in advance and also because the stock carried at these locations are inherently limited. Okay, so why am I talking about pop up stores? Well, recently I took a vacation. On my vacation I did only one full yoga practice, but I did a lot of ‘pop up’ yoga, and I found it helpful, satisfying, and also kind of fun. Here, in this photograph, we were waiting for our ride from the airport to our hotel. My back was cranky from the plane ride and standing was pretty much the last position I felt like being in. 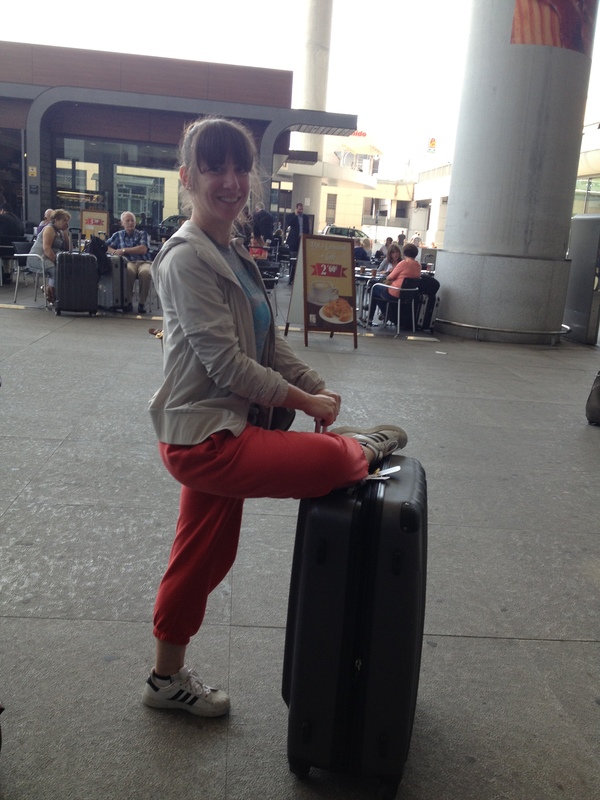 So…a backed up version of Ardha Baddha Padmottonasana using my suitcase. I actually do pop up yoga at home too. 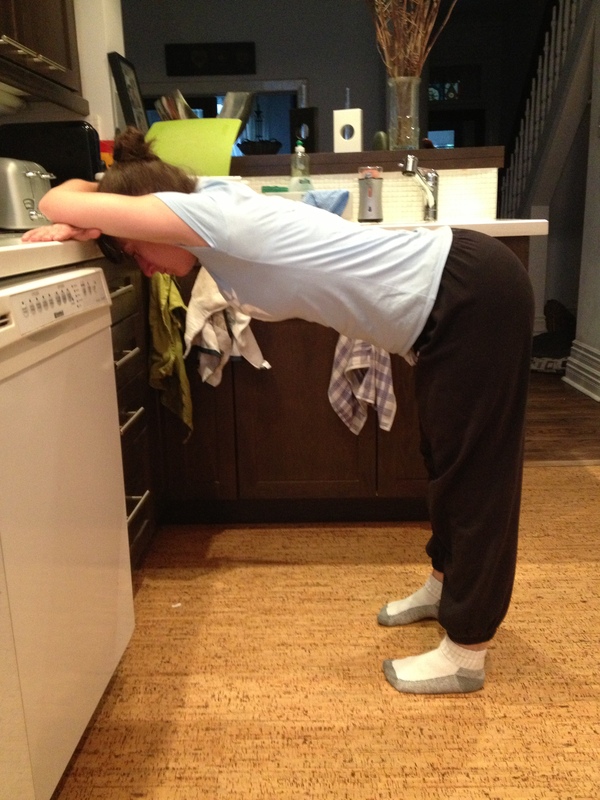 Here’s a photograph of me passing the time in Ardha Uttanasana waiting for the kettle to boil. I don’t have a picture of this one, but I’ve also been known to do Utthita Hasta Padangusthasana I & II using the bathroom counter or sink as a ledge for my foot. Why do I bring this up? Well, I think people generally underestimate the value of pop up yoga. People often think that if they don’t have enough time for a full practice then it’s not worth striking a pose. I beg to differ. In my experience, not only is pop up yoga immediately gratifying but it also can be quite effective. You certainly are not going to reach new spiritual heights with an occasional yoga pose here and there, but who knows, you may prevent an old injury from acting up. In my opinion, some yoga is always better than no yoga! Have you been known to engage in the occasional pop up yoga pose? Great post and so true! After I had my daughter and had no time for a full practice I did shoulder openers everywhere & anywhere to help with the soreness of breastfeeding. It is also a great way for beginners to start to incorporate 1-2 poses daily. Great post! I actually love incorporating the pop up yoga into my life! It does the trick especially when you travel. Speaking of which where did you and Steve go without Casey! I am so happy that you got away. Well-deserved vacation! Hopefully I’ll be back to yoga soon. I had a real flare up with both knees with swelling-go figure. So was doing lots of inversions, elevating and ice. Body just is compensating for unstable pelvis. Keep up the great work. I so look forward to your blog. Your post is great encouragement at the moment! I’ve broken my hand, typing slowly with my healthy left. Yoga has become tricky…but not impossible and pop up yoga is perfect for me right now. Thanks!!! Yoga everywhere! I practice my tadasana when I’m washing up in the shower, brushing my teeth, or standing in line. 🙂 great idea!